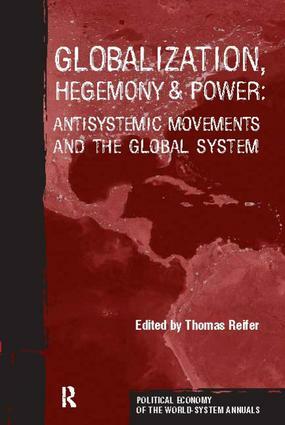 Introduction: Hegemony, State-Corporate Globalization and Antisystemic Movements: Contending Theoretical and Historical Approaches. CONTEMPORARY GLOBALIZATION. The United States in Decline? ; Immanuel Wallerstein. The Phoenix-Cycle: Global Leadership Transition in a Long-Wave Perspective; Joachim Rennstich. From State Hegemonies to Transnational Hegemony: A Global Capitalism Approach; William Robinson. Quantifying Hegemony in the World-Economy; Jeffrey Kentor. Servants of the World-System: An Analysis of Servitude in the U.S. and the New International Division of Reproductive Labor; Amy Holmes. Globalization-The New Mechanism of Dependency; Kathleen Schwartzman. Shippers and Carriers: Class Struggle in the Global Logistics Sector; Edna Bonacich. COUNTER-HEGEMONIC SOCIAL MOVEMENTS. Hegemonic Decline and World Revolution: When the World is Up for Grabs; Terry Boswell. The Politics of Global Islam: U.S. Hegemony, Globalization and Islamist Social Movements; Paul M. Lubeck & Thomas Ehrlich Reifer. Hegemony Lost: Understanding Islamic Fundamentalism; Lauren Langman & Douglas Morris.